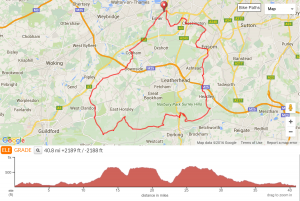 Three good hills in a 40 mile route to test the climbing legs. Staple Lane, Crocknorth and Box Hill. The usual coffee stop is at the Box Hill cafe. The homeward leg includes the fast-as-you-can Horton roundabouts section!